Coordinates the preparation of printed and electronic materials to ensure consistent branding; prepares news releases for chapter events and develops strategies to promote AFP in the local community. Contact Ashley Forshee, Communications Chair. 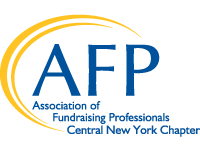 Develops ongoing educational programming for members including monthly luncheons, webinar series, and the annual celebration of Fundraising Day, and secures speakers for AFP events. Tracks chapter membership on a monthly basis reaches out to lapsed members and those nearing their membership renewal date, develops creative strategies for increasing membership numbers. Oversees the planning and implementation of the annual National Philanthropy Day celebration, including awardee nominations and event management.